Rangeela lets go of the door. Pushkar manages to step outside. It is you right? You are taking revenge from me but I wont let you succeed Vidhita! I will go away from you and this place! Rangeela informs everyone that Pushkar is dead scared. He is certain it is Vidhi’s ghost who is seeking revenge from him. Kabeer says we should take our next step now. Rajshri remarks that the next step needs to be very crucial. With this, we have to make him accept his crimes. If we commit any mistake here then it will go down the drain. Pushkar comes downstairs holding a suitcase and finds his mother crying. She tells Pushkar that there is no news of Vidhi. The number of NGO people is coming off too. Hope she is fine. She notices his suitcase. Are you going somewhere? We are so concerned about Vidhi and you don’t care? He denies. I am going to Delhi to find out about her only. Rajshri shares that he need not go there. I have found that this number if Jodhpur’s number. I have the address as well. Let’s go and find out about it. Rangeela gestures Pushkar against it. Pushkar advises his mother not to lose hope. Maybe Vidhi will come today. He takes the details from her and offers to find more about it. He takes Rangeela with him. Rajshri tells Bela’s mother it is time to implement their next step. Pushkar comes to the location provided by his mom. Kabeer has fitted a microphone and camera in every room. We will scare Pushkar so much that he will confess all his crimes. Rajshri tells Vidhi and Badri to enter from the backdoor. There shouldn’t be any mistake. Pushkar tells Rangeela it seems there cannot be anyone here. It is deserted. Rangeela suggests investigating once now that they are here. I find this place haunted. Pushkar insists Vidhi is dead. We have to find out who is playing with Ma’s emotions and what their intention is. Rangeela nods. Pushkar calls out if someone is there. They hear a noise and turn around startled. Pushkar notice a paper bag with two eyes. He recalls how he had worn a similar bag over his face in the past. He points it to Rangeela but Rangeela claims he cannot see anyone. His phone rings and he excuses himself. Vidhi ducks by the time Pushkar turns in her direction. Pushkar looks in another direction and Vidhi appears again with that paper bag mask. He is freaked out. She ducks and removes it when he turns again. He keeps looking in different directions out of fear. Who is it? Vidhi speaks using a mike. How can you forget this mask? You used it to hide your identity in the past. You have hurt many people with its help. Vidhi wears the mask again and steps forward. He demands to know who is it. He lifts his hand and burning fax falls over his hand (with a rope pulled by Vidhi). He thinks of the past. Vidhi asks Pushkar how he is feeling after experiencing this pain. You have hurt people in a similar manner in the past. She covers her face with a red colour and steps forward. He warns her to stay away. She asks for justice. Show your real face and recall all that you have done to me! Kabeer and Rajshri are watching the video. Kabeer tells Rajshri they are on the right path. Pushkar’s fear will very soon make him fall in our trap. Vidhi hides again and uses the mike. I want to hear your every crime from your mouth today! He shouts at her to come in front of him. Step forward once. He starts throwing stuff around randomly. Rajshri tells Kabeer Pushkar is turning wild. Where is Payal? Kabeer is sure Payal has hidden somewhere. Pushkar will very soon confess his crimes. Vidhi shouts as she gets hurt. Pushkar gets alert. Ghosts never get hurt but I heard someone scream in pain. Vidhi runs. Pushkar heads in her direction. Kabeer, Rajshri and Rangeela are worried as they cannot see Vidhi or Pushkar anymore. Pushkar finds blood stains on the floor. This ghost can get hurt and is wounded? It means Payal / Vidhi is alive! Vidhi is sure Pushkar would have heard her scream. He now knows I am alive. He would have understood that I am not a ghost. I should get out of here! Rajshri points at the screen. Pushkar steps back with folded hands. Please forgive me Vidhi. I wont do it ever again. Tell me what you want. Kabeer and Rangeela fall in his trap and so does Vidhi. Pushkar begs Vidhi not to scare him more. I cannot take it anymore. I will do just as you say. Vidhi picks the mike again. You know what you have to do! You know why I am troubling you. The same pain that you had given me! He agrees to comply to her every demand. Just stop scaring me and leave me alone. Kabeer is happy that their plan is on the right path. Rajshri looks doubtful. Vidhi agrees to leave. I wont trouble you ever again. She wonders why Pushkar isn’t replying and comes out of her hiding place. Pushkar steps behind some stuff. Vidhi follows him unconsciously. Rangeela and Kabeer get concerned for Vidhi. Rajshri is certain something is wrong. Go and check on her. She might be in trouble. Kabeer and Rangeela leave. Rajshri prays for Vidhi’s well being. Kabeer, Rangeela and Badri don’t find Vidhi anywhere. They spot blood marks on the floor. Kabeer informs Vidhi that their plan has failed. Pushkar has probably left with Vidhi. They rush out. Flashback shows Pushkar realising that if Vidhi is real then Rangeela has lied to him. It means he is on their side. I have to find out who all are in this plan against me. He also notices the CCTV camera in the room. It means there is a microphone and camera in the room. I have to find a corner where there is no camera. He walks to that corner while pretending to apologize and hides behind a cupboard. Vidhi follows him to that place. Pushkar steps forward suddenly and covers her mouth from behind. I found you! Flashback ends. Pushkar tells Vidhi her gang members left. You are with me now. We have played enough hide-and-seek as a ghost. Let’s play hide-and-seek of life and death now. Precap: Pushkar tells Vidhi one has to die to really become a ghost. Vidhi pushes Pushkar. It is true that I am Vidhita Chauhan! I was helpless to let you hurt me in the first place. I should have broken your arm the moment you had raised it to hurt me in the past! You are an animal! Women like me should always tackle animals like you in the first go itself! 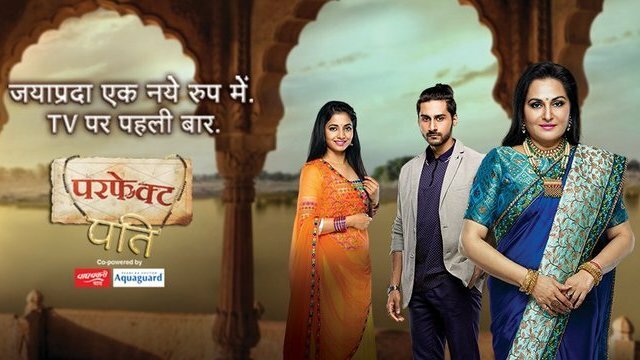 The post Perfect Pati 21st February 2019 Written Episode Update: Pushkar traps Vidhita appeared first on Telly Updates.